We're just now starting phase 2 of an interesting interior finish work project for Tom and Beth Klemmer of Middlebury. Tom is an accomplished woodworker in his own right, and apparently enjoys a challenge. Last year we installed a new slate floor with radiant heating in the Klemmer's family room as part of their plan to remodel the space in the Greene and Greene style of architecture. This style is known for its large, heavy woodwork and interesting joinery. 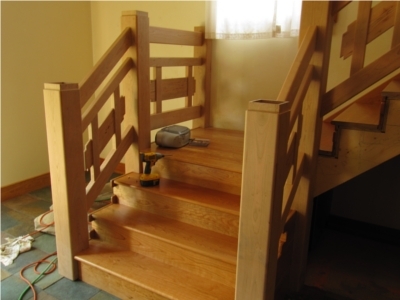 These pictures show the cherry woodwork on the staircase with it's heavy newel posts and railings. Tom did all the railing panels himself (nicely done, Tom). He also did the false tendon work on the plank wall under the stairs. Our guys did the posts, treads and risers and flooring. In this phase, we will be redoing the loft area. We'll post updates as the work progresses. We are excited to announce that Three Oaks is expanding to now offer Conner Homes as an option to our customers. While we will continue to offer all of our usual custom construction services, we believe that Connor Homes will bring a distinctive advantage to our customers. Their reproduction Colonial Homes are beautifully crafted with painstaking attention to details and because much of the work is completed in their millwork facility, duration of field construction should be significantly reduced. This allows for a smoother, shorter building schedule. You can visit their website at http://www.connorbuilding.com Feel free to call us or them to get started on your new home. The guys at Three Oaks recently finished up an expansion project at Mount Pleasant Sugarworks located in Leicester. Andy and Donna Hutchison have been having trouble working in the cramped sugarhouse with all the increased production they've seen over the past few seasons. This renovation gives them an additional 1,500 square feet of interior and exterior space for storage and equipment. Their maple sugaring operation has been providing first rate quality syrup since 1987. When they started, it was just a small hobby set up. Now, with the help of Andy's dad, Galen, they're making over 1,000 gallons of syrup per season! When Andy is not sugaring, he might be marking timber lots in his forestry business, designing someone else's sugarhouse, or tending to guests at their Bed and Breakfast. If you are visiting in the area, consider staying at the Hutchison's. Three Oaks wins the "Break Out of the Indoors Contest!" We have won the "Break out of the Indoors" contest! To see the posting on the Fine Homebuilding site, click here. And for the post that we put on, click here. We hope to have a picture available soon!